Have you ever been in a car wreck you saw coming? I was a passenger in this type of collision in high school. Even though we were stopped, I saw that the car turning left was about to get hit, and would likely collide into us. That split second was so strange because it felt like it happened in the blink of an eye, but time slowed down enough that I anticipated the impact and had time to brace for the crash. That’s how interviews feel. Each program varies in how they conduct interviews, and programs like to change up their methods occasionally. Imagine the difficulty of having 10-20 minutes of face time to choose a limited number of students to not only succeed in the program, but get along as a class. While there are some aspects you can expect and prepare for, be ready for the unexpected as well. Schools are looking for applicants who can be flexible and adapt easily without getting flustered. For the most part, interviews consist of the same components: a tour, an orientation to introduce you to the program, time to interact with current students and meet faculty, and some type of face-to-face interview. Optional components may include an essay or group session, or even a quiz! Programs could let you know beforehand about a test, or just surprise you after arrival. Again, be prepared for anything. Go into the interview expecting the unknown, so you’re less likely to be thrown off when something comes up you didn’t prepare for. Keep in mind with these various elements that every single part of your experience is part of the interview, even when you're just chatting it up with current students! Ideally, if you know what to expect before going into the interview, you'll be able to prepare most effectively, but that's not always possible. In any case, it's worth taking some time to prepare by going over commonly asked questions and reviewing your CASPA application. For more information on PA school interviews, check out the Physician Assistant School Interview Guide. I was recently asked by Adanna (a PA student who is killing it with her YouTube videos) to contribute some interview tips from the Physician Assistant School Interview Guide in a video for her channel. You can check out the video here to get my 5 Crucial PA School Interview Tips! Everybody wants to know - How do I stand out at PA school interview? - Valid question. The key is standing out in a good way and not a bad way. After doing a bunch of mock interviews and speaking with faculty and admissions committees, I've found there are some common mistakes and small things you can do to help yourself stand apart from the other applicants at your interview. I don't feel like any of these are groundbreaking tips, but just reminders to keep in mind when you're walking in to your interview. It's easy to let nerves get in the way and lose sight of your goal: convincing your interviewer that you are the best person for a spot in their PA program and that you will be a great classmate and colleague! CONFIDENCE! This is the biggest thing that seems to be missing when I'm working with applicants. Even if you are terribly nervous and don't feel confident at all, you need to be able to fake it. Confidence goes a long way in an interview setting and can definitely make you appear ready for PA school. Just the fact that you got an interview invitation should give you confidence because it means you had a strong application and they want to see who you are as a person. They want to see mature candidates who can handle themselves in high stress situations, such as a PA school interview. Be yourself. One mistake many candidates make is trying to mold their answers to what they think the admissions committees are looking for. The problem with this is losing yourself in the process and not showing your personality in the interview. As a PA, you need to be able to connect with patients and just be yourself. It's evident if you are not showing your true colors so when you're practicing, video yourself to make sure you're giving the impression you're trying to make. Avoid negativity. This should be a given, but no one really likes a negative person. Try your best to stay positive throughout your interview. If you're discussing a tough situation, focus on the good parts and learning lessons. Avoid putting down any other professions as this is typically looked down upon. Interact with fellow applicants. Some of the other applicants at your interview may end up being your classmates! Working as part of a team is a big part of both PA school and being a PA, so they'll be watching at your interview to see how you interact with everyone else there. Learn names, refer to other applicants, and just be cordial in all of your interactions. Have thoughtful answers. This is addressed in the Physician Assistant School Interview Guide very thoroughly, but one issue I've noticed is some applicants don't think about why a question is being asked. It's great to provide a story or example, but it needs to have a lesson that relates to you becoming a PA. When you're practicing, consider bringing your answers full circle and making sure they fully explain what you learned and make those connections to how you'll be a better PA student or PA for it. Over the past 2 years, I've had the privilege of working with hundreds of hopeful PA candidates on their interview skills, and over that time, I've learned a lot myself. I've seen the most common mistakes and how many applicants lack the confidence necessary to secure a spot in a PA program. When it comes to applying to PA school, the personal statement is what lands you an interview, but the interview is what gets you in. Part 1 - Getting Ready - This section breaks down the different types of interviews you may experience at various PA programs so you'll know what to expect before you get there. Then we talk about the steps you can take to prepare before and after you receive the invitation to interview. This is where I share the techniques necessary to impress your interviewers. Part 2 - The Questions - For this section, we dive into different types of questions and interviews and how to address them. This includes traditional questions, behavioral questions, ethical questions, multiple mini interview (MMI) questions, group interviews, essays, and then we end with the questions you need to ask your interviewers. Each chapter has tons of questions with tips, examples, and ways to rephrase the questions so you don't get caught up on how questions are phrased. Part 3 - Follow-Up - This is everything for after the interview and an FAQ to answer any remaining questions. You'll also find Interview Preparation Worksheets, a Mock Interview Guide, and a Master Question List of the over 300+ questions listed in the book. There's a lot packed into these 210 pages! So, how can you get one? The book is available for $15.99 through The PA Platform with free shipping, or if you have Prime, it's on Amazon through this affiliate link for $18.99 with 2-day shipping! I really hope this will be a great resource to help you take control of your interview. If you have any questions, feel free to reach out and I would love any feedback you have to share or an Amazon review! Valid question. When you’re faced with “Well, do you have any questions for us?” I completely understand not wanting to sit there like a deer in the headlights. This is your one opportunity to get the additional information you’re seeking and show your interest, as well as your last impression with the interviewer. Consider two approaches - school focused or personal. Be careful to not ask about anything already covered in a tour, on the website, or by students as this looks like you weren’t paying attention. Try to keep questions open ended instead of yes/no and avoid asking questions that portray you as skeptical of the school or your abilities to succeed. Why should I pick your program over a different one? What do you do for students if they are failing? Why is your PANCE rate lower? Why did less students take the PANCE than matriculated? Why didn’t 3 of the students graduate? While these are valid concerns, it might be better to inquire on a private forum or from students instead of during your actual interview. You don’t want the program to feel you are less than excited about being in their class. Attempt to keep your questions positive and relative to why you need to be in their class. Besides school-specific questions, you can ask personal questions of your interviewers as well. While they are getting to know you, this is your chance to also get to know them. If they ask an interesting question, feel free to ask them the same one! I used that tactic and my interviewers enjoyed being asked something out of the ordinary. It also gives you an option if you feel like the details of the program have been adequately covered during your time at the interview. Where did you go to PA school? What is your favorite part of teaching anatomy, pharmacology, etc? Why did you choose to teach PA school? What can applicants do to make themselves stand out for your school? What qualities do you look for in PA students? 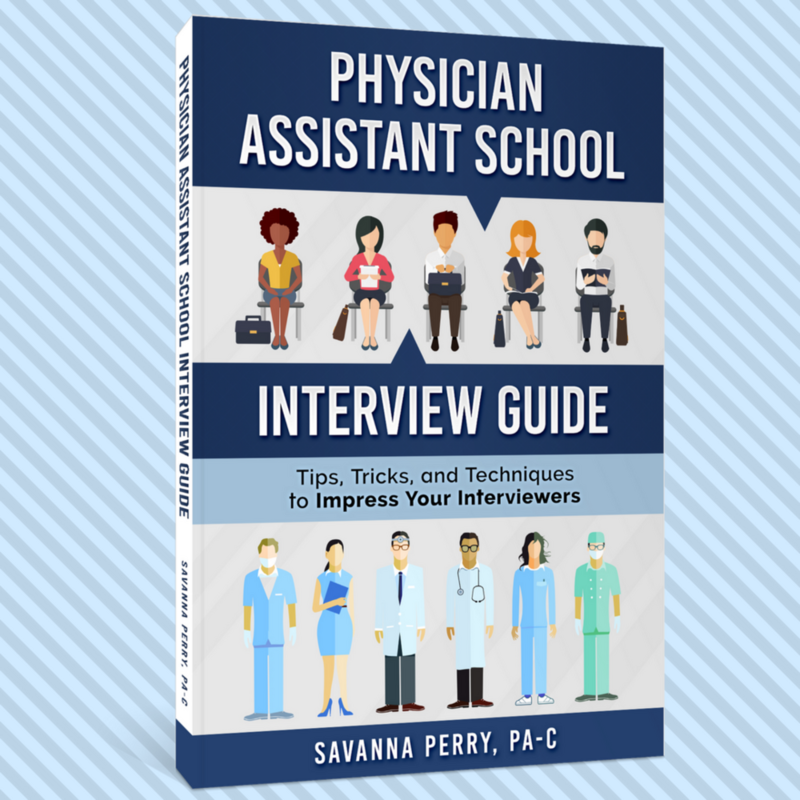 For more tips and tricks for your PA school interview, check out the Physician Assistant School Interview Guide. MMI is my least favorite type of interviews. It’s difficult to prepare for because the questions tend to be completely random, and you usually don’t get an opportunity to directly address the reasons you want to become a PA. MMI elicits much more of a show, don’t tell impression, and the point is to find out more about your character. The prompts can be anything from routine interview questions or completely random questions to ethical situations, critical thinking scenarios, or acting stations with standardized patients so you need to be ready for anything. The program is going to use scenarios that will assess different qualities, such as empathy, decision making, and communication skills. There are not necessarily right or wrong answers to these scenarios because the goal is to get a well-rounded look at you in a short period of time. The point is to evaluate the attributes and personal characteristics you would exhibit as a PA.
You want to be able to show the interviewer that you are considering all sides to the prompt, and that you are able to choose an opinion and explain it. If you are able to identify what characteristics each particular scenario is looking for, that will help you know how best to respond. In an MMI, you should have plenty of time (usually 5 minutes) to make your case. Practice answering everything the prompt is asking to make sure you’re not leaving a portion out. You are caring for an obese patient who is on multiple medications, some of which are causing side effects. Would you prefer the patient change medications or their lifestyle? • Restate the issue and explain the role you would play in this scenario. For example in the prompt, it does not explicitly say that you are acting as a physician assistant, so you could start by saying, “ I am assuming that I am the PA caring for the patient in this scenario because it does not clarify. I need to determine if this particular patient who is obese and on multiple medications should change their lifestyle or have medication changes because they are experiencing side effects from some medications.” This shows you understand the prompt, and helps to make sure your thoughts are organized. • Present both sides and look at the pros and cons. In this scenario, that is lifestyle changes versus changes in medications. The pros of lifestyle changes include weight loss and overall increased health with a better diet and a focus on exercise, and possibly the need for less medication, so less side effects. The cons of lifestyle changes are that it is a more difficult decision that requires patient compliance and cooperation to enact, and it may take a while before the patient makes enough progress to discontinue the medications that are causing side effects. The pros of changing medications are a possible decrease in side effects that are bothersome to the patient, while the cons are that the new medications could have other side effects or not be the first-line choice for this particular patient. • Once you’ve broken down both choices, you have to make a decision. It’s fine to say you would discuss or consider both options with the patient and offer them choices, but ultimately, what would you “prefer” as the prompt asks? There is no right answer. Personally, I would encourage lifestyle changes for a set period of time before changing medications, unless the particular side effects were debilitating or would interfere with the patient being able to make lifestyle changes. I would try to educate the patient on steps they can take to improve their overall health to try and discontinue some of these medications that are causing problems. When you are practicing any ethical questions, try to use these techniques if you have an MMI coming up and work on evaluating all options instead of jumping straight into your decision. A question that commonly comes up in regards to appropriate etiquette following the interview is what now? Should I send thank you notes? An email? Who should I send them to? Will it look bad if I don't send them? No matter how you look at it, it’s always nice to get a handwritten note. If you are wanting to send something to the program to say thank you, sending an actual written card in the mail is a great option. If that's not your cup of tea, it's alright because we live in a technology era where email has become the norm. And that’s not necessarily a bad thing! An email is a quicker option to send your thanks to your interviewers. If you are planning on sending a note of thanks, it doesn’t matter which you choose, so go with whichever option you feel more comfortable with. To know who or where to send your note or email can be a hurdle to actually being able to give your thanks. Try to get this information at your interview, whether it’s provided on a handout or by asking the program coordinator. If you forget (probably due to nerves, which is completely reasonable), contact the program coordinator after the interview, and see if they can provide the mailing address or emails that you need. If you don’t recall your interviewer’s name(s), then you may be out of luck with getting this information at a later date. You can keep your note short and sweet because you want to be respectful of your recipient’s time. Thank your interviewer for taking the time to interview you and the opportunity to learn more about their program. If there’s anything memorable or specific that you discussed during your time with the interviewer, you can refer to that in your note to help your interviewer recall you more. While thank you notes are a nice gesture, you don’t need to feel like they are an absolute necessity. At the end of the day, it’s a courtesy, and not a factor that will have an impact on your acceptance to PA school. So don’t let the idea of getting names and addresses and writing thank you notes stress you out. If it’s too much to handle right now, that’s ok! To be perfectly honest, I did not send thank you notes. When I went on my interviews, I was in the middle of finals and actually had to reschedule some of them, so that was my priority at the time. And I was still accepted! Leave any advice/questions you about thank you notes in the comments below!